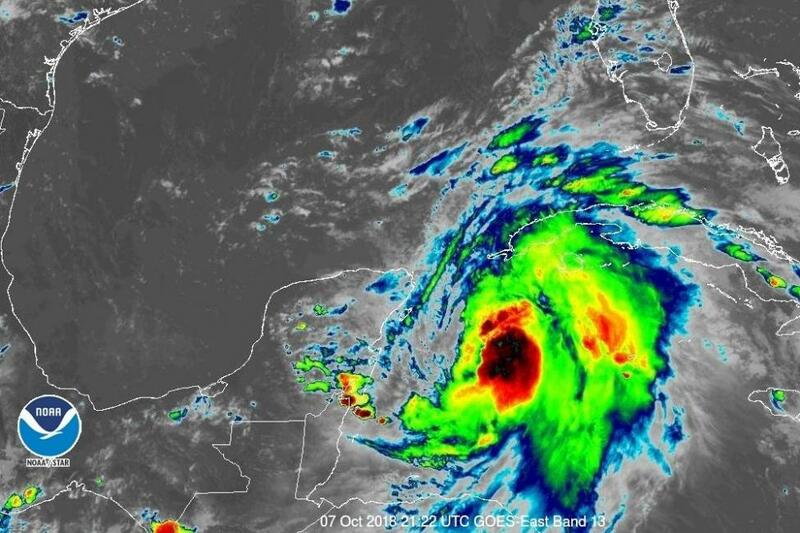 Tropical Storm Michael began slowly moving toward the Yucatan Channel on Sunday afternoon, the National Hurricane Center said. Before the depression became a tropical storm, Florida Gov. Rick Scott announced he will issue a state of emergency in the Florida Panhandle and Big Bend. The NHC said Michael could strengthen into a hurricane by Wednesday when it reaches the Sunshine State. "Satellite wind data indicate that the depression has strengthened the Tropical Storm Michael, NHC forecaster Daniel Brown said in a posting. Michael was about 130 miles southeast of Cozumel, Mexico, and 190 miles south-southwest of the western trip of Cuba, the NHC said in its 4 p.m. CDT advisory. The storm was moving north-northeast at 3 mph with maximum sustained winds of 40 mph. A tropical storm warning is in effect for the Cuban provinces of Pinar del Rio and the Isle of Youth as well as the coast of Mexico from Tulum to Cabo Catoche. The NHC said an increase in forward speed is expected over the next few days. On the forecast track, the center will move near the northeastern tip of the Yucatan Peninsula on Monday morning and later move across the eastern Gulf of Mexico late Monday through Wednesday morning. Once it reaches land, Michael is forecast to weaken into a tropical storm when it passes through the East Coast, including the New York metro area by Friday morning. Total rain accumulations of 3 to 7 inches are expected over western Cuba and 2 to 4 inches over the Yucatan Peninsula, Belize and northern Honduras through Tuesday. Because isolated maximum amounts of 12 inches are possible in western Cuba, the NHC warned of life-threatening flash floods and mudslides in areas of mountainous terrain. Scott declared an emergency when it was Tropical Depression 14 on Sunday morning. By declaring the state of emergency, Scott is activating the State Emergency Operations Center for enhanced coordination between federal, state and local emergency management agencies. And he said "families need to get prepared." "Our state understands how serious tropical weather is and how devastating any hurricane or tropical storm can be," Scott said. "As we continue to monitor this storm's northward path toward Florida, it is critically important that our communities have every available resource to keep everyone safe and prepared." The only other storm in the Atlantic is Tropical Storm Leslie has zig-zagged in intensity. Leslie is traveling east-southeast at 10 mph with maximum sustained winds of 60 mph and is several hundred miles from the United States and Caribbean, the NHC said in a 5 p.m. AST advisory. Forecasters said it could become a hurricane by mid-week. Leslie became a subtropical storm on Sept. 23 but weakened into depression then back into a tropical storm and then a hurricane.